Since one-carbon assimilation could greatly reduce industrial production cost and also would alleviate the pressure of resource supplement for bio-manufacturing, which will produce more than 35% industrial chemicals until 2030, it is extremely important to develop metabolic pathway for one-carbon utilization. As earlier as the end of 2013, we began to explore how to efficiently convert one-carbon resource into central metabolites. Due to the innate defects such as carbon loss, oxygen sensitive, ATP-dependent for the natural one-carbon utilization routes, we proposed to construct an artificial pathway for one-carbon utilization. The simplest way to synthesize organic carbon from one-carbon is to construct it one by one. We firstly designed a novel enzyme, glycolaldehyde synthase (GALS), which condenses two molecules of formaldehyde into one molecule of glycolaldehyde based on the protein structure of benzoylformate decarboxylase (BFD) from species Pseudomonas putida. Unfortunately, when we were exciting to prepare our manuscript, a very similar work was published on PNAS at January 2015 from David Baker’s lab. Three molecules of formaldehyde were condensed into one molecule of dihydroxyacetone. The whole team was much cast down at the moment. In order to push this project going on, we noticed that the novel pathway designed by Baker’s lab could loss one carbon to synthesize the center metabolite Acetyl-CoA, which is a key starting point for the biosynthesis of a variety of industrial chemicals and natural products. 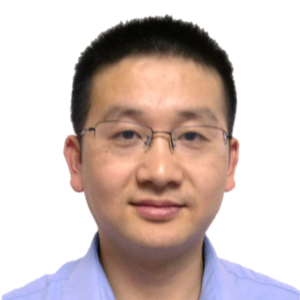 Prof. Huifeng Jiang was very excited to propose that we could construct one-carbon utilization pathway that directly condense two formaldehydes to form one acetyl-CoA. It is so cool for this pathway! Strong curiosity urged us to do the following works. We named this pathway as the Synthetic Acetyl-CoA (SACA) pathway, where two molecules of formaldehyde would be transferred into one molecule of acetyl-CoA through only three steps (Fig.1a). We calculated the thermodynamics of the SACA pathway and compared it with previously reported pathways (Fig.1b). 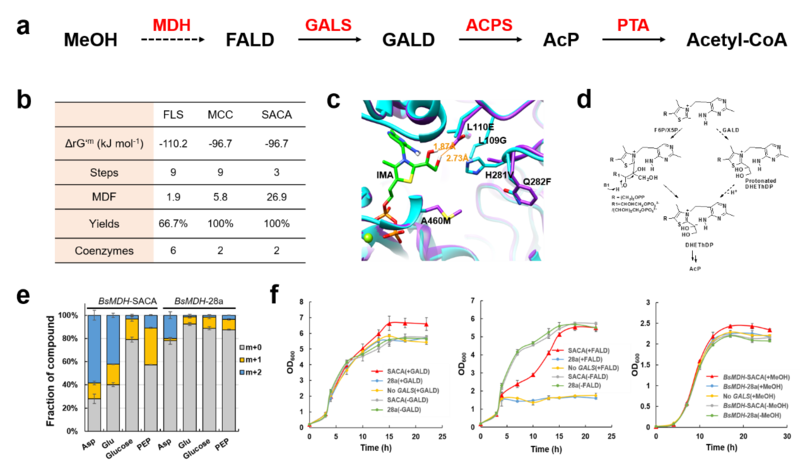 Surprisingly, the SACA pathway has very strong driving force in vivo. The glycolaldehyde synthase was further engineered for formaldehyde condensation (Fig.1c) and an acetyl-phosphate synthase was obtained for acetyl-phosphate synthesis (Fig.1d). We firstly demonstrated the feasibility of the SACA pathway in vitro. Then we tried to track intracellular metabolic fluxes using 13C-labeled formaldehyde. Unfortunately, we were only able to detect double 13C-labeled TCA metabolites in cell lysates rather than in vivo. What is causing this? We suspected that the possible cause is the high toxicity of formaldehyde. Then we added methanol dehydrogenase to the SACA pathway and repeated the experiment with 13C-labeled methanol as the substrate (Fig.1e). Subsequently, we used different carbon sources for growth experiments, confirming that the SACA pathway can significantly increase biomass (Fig.1f). Although the SACA pathway is not currently practicable due to the low catalytic activities of the designed enzymes and the toxicity of formaldehyde, it would be feasible by continuing to improve enzyme activities and to increase formaldehyde tolerance at the next step. Furthermore combining with the electrochemical conversion from CO2 to formic acid and biotransformation from formic acid to formaldehyde, I believe the SACA pathway can be applied for industrial chemicals manufacture from CO2 in the future. Figure. 1 Design and application of SACA pathway. a Schematic diagram of the SACA pathway. b Thermodynamic parameters of different pathways. c The overview of the GALS mutations in active center. d Design principle of ACPS. e 13C labeling experiment in vivo. f Assessing the SACA pathway by cell growth.